As Jesus was in the wilderness 40 days preparing himself for His purpose on earth, he meditated and prayed, not without struggle, tests and temptation. 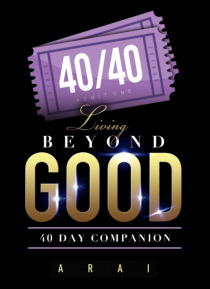 40/40: Living Beyond Good 40 day companion, is a collection of personal prayers and motivational excerpts from Arai's journal. These intimate, inspirational excerpts span 40 days worth of prayers prayed while Arai journeyed seeking her purpose and … withstanding tests and trials.